From September 14th-22nd, there will be community-based events happening all across Toronto for Urban Agriculture Week 2019, and Toronto Urban Growers is currently looking for those interested in urban ag to get involved! 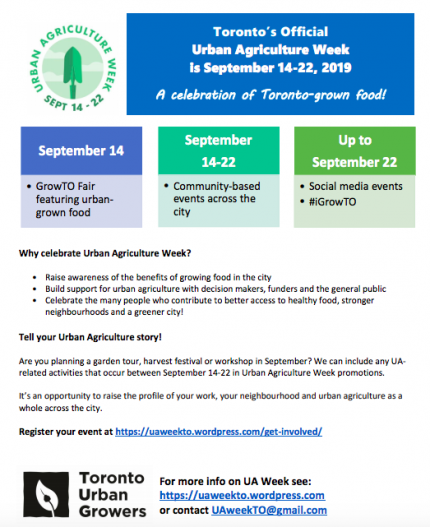 On September 14th, Toronto Urban Agriculture Week will kick off with a GrowTO Fair, featuring urban growers, vendors and exhibitors. This is an opportunity to showcase your work, your neighbourhood and urban agriculture as a whole. Not to be missed is the ‘Best in GrowTO’ contest — think you have the best squash in town, or the best honey? Enter in the competition and test your skills! Are you interested in planning a garden tour, harvest festival or workshop? Tell your urban agriculture story during Urban Agriculture Week. Organizers are looking for people and/or organizations who would be interested in participating. Participation can take many forms — they are open to all kinds of ideas. Check out the Toronto Urban Agriculture Week website and register today!